Writer, photographer, commercial fly tyer and guide…if it has to do with fly fishing you can bet Jason Akl will be there. 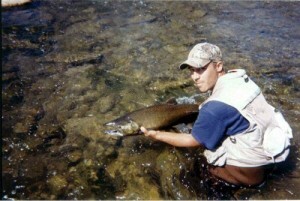 Over the last decade fly fishing/ tying has been more than just a weekend hobby for Jason. The sport has become the staple that most of his life revolves around. Professionally, Jason has been a seasonal guide and commercial fly tier that teaches tying/ fishing classes to both adults and children. Jason shares his in-depth knowledge regularly through written pieces which have appeared in both Canadian and American publications, as well as numerous global websites. Jason is a member of the pro-staffs for Daiichi, Monic fly lines, Gatti fly rods, Triple Fish Lines, and Bluesky leaders. Jason and his wife Stacy, currently reside on the shores of Lake Superior in Ashland, Wisconsin.